Keep children safe with the roller blind–style safety gate that rolls back and disappears in to a wall-mounted casing when it’s not in use. There are no bottom bars or beams, which means there are no trip hazards making KiddyGuard a neat, safe and toe-friendly stairgate! The gate can be opened and closed with just one hand and has an automatic lock with a pop–up red warning button. The KiddyGuard can also be locked manually. KiddyGuard Accent is easy to fit and offers lots of flexibility because it can be used for openings of various sizes up to 100cm. The strong mesh screen can withstand the impact of up to 100kg (220lbs) in weight giving you a safe, discreet and stylish stair gate that blends in to your home. All KiddyGuard gates meet current EU safety standards. For easy fitting see our videos and instructions. Banister and skirting installation kits are also available. Check here to see if you need either of these accessories. If yourKiddyGuard is going to be attached to a wall with a skirting board, you will need a small piece of wood to create a straight, flat surface for the KiddyGuard housing (the bottom of the KiddyGuard will need to attach to the skirting board). Alternatively you can try the skirting installation kit. Why can a KiddyGuard only be used with children up to 2 years old? To comply with safety standards, all stair gates and stair guards can only advertise suitability for children up to 2 years of age (24 months).Children over 2 are dexterous and adventurous. They will work out how to open a stair gate and/or climb over it. It is therefore not possible for ANY stair gate, including the KiddyGuard, to necessarily prevent accidents when your child is over 2 years old. Parental supervision is the best form of security at this stage. The best recommendation, whether or not the stair gate is closed, is to always supervise your child, whatever their age. Can I attach it to wood or stone masonry or glass? The standard KiddyGuard Accent and Avant installation package includes 2 long wood screws for attaching to wood. It also includes 2 rawl plugs for attaching to masonry. Please download the fitting instructions for further details. 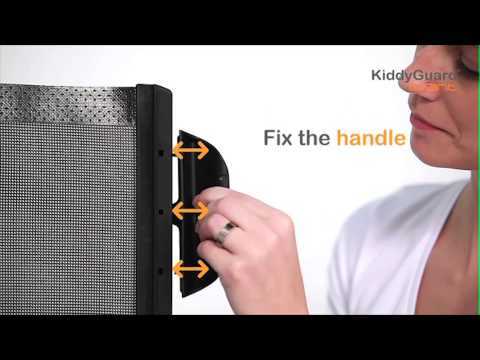 The KiddyGuard Accent and Avant cannot be installed onto glass. Like Phil's review below, our Lascal Accent failed after less than 2 years. Wish I had done better research - looking at eBay there are a lot of broken ones . . . I was fobbed off with the normal outside of the 1 year manufacturer's warranty rubbish, so am beginning a claim under SoGA 1979. Clearly not reasonable for this product to break after less than 2 years. They then said it can't be repaired because it is a safety product - really! Good job, it didn't break when my children were at the top of stairs. Anyway, don't buy this product - it won't last and so it not worth the extra investment. Thanks for your feedback, I hope our response from our Customer Services team has resolved the issue for you. Lascal prides itself on it design and manufacturing, however this product lasted us 18 months. When spending that little bit more for a baby gate that's safe and also looks great I was really disappointed with being told the warranty is only one year and not even offererd a fix. I wouldn't recommend this product as it won't last long enough for one child. We’re really sorry that you’re disappointed with this product. Without knowing exactly what has happened we cannot comment on this particular situation, however we thought we should clarify the situation on repairs. As this is a safety product, repairs are not allowed, therefore we cannot offer this service. If we can help in any other way please do give us a call on 01730 895761 so that we can discuss this in a bit more detail. The KiddyGuard Accent is exactly what we were looking for after using a more traditional gate for years. We recently redecorated our house and wanted to install less obtrusive baby/dog gates and we're very happy with the KiddyGuard.